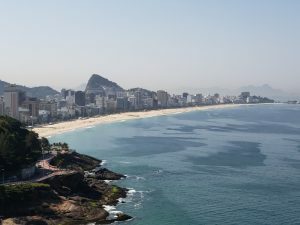 I have been to Rio de Janeiro many times, both for work and pleasure. So I know all of the hotels. Based on all of the variables, I chose the Sheraton Grand Rio. 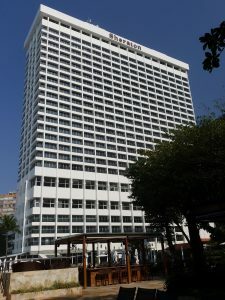 The designation “Grand” has only been given to about 20 Sheraton hotels worldwide (out of more than 500) based upon their location (near a beach), hard product (physical structure) and soft product (service). And the Sheraton Grand Rio is the only Sheraton Grand in South America. 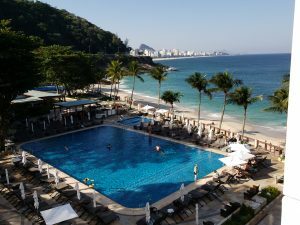 One of the main things I like about this hotel is that it is the only hotel in Rio which is directly on the beach and has a really nice pool area. In addition the hotel was recently remodeled. 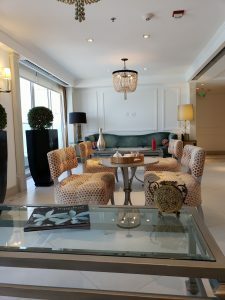 They moved the Executive Lounge (which I had access to as a Starwood Platinum member) from a small space on the 3rd floor to a former suite on the 26th floor, which is the top floor of the hotel. My room had two queen beds and 3 balconies, one which was a wraparound oceanfront balcony. 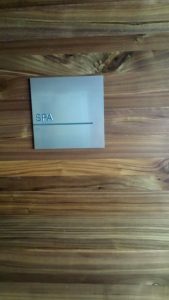 The hotel had a great spa, with complimentary use of the steam room, sauna and gym. 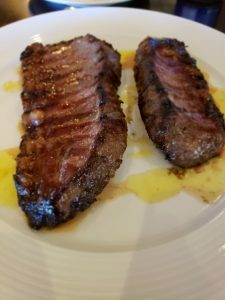 The hotel also has several restaurants, including a Brazilian Churrascaria, a poolside restaurant, an Italian restaurant, and a critically acclaimed French restaurant on the top floor (across from the Executive Lounge). 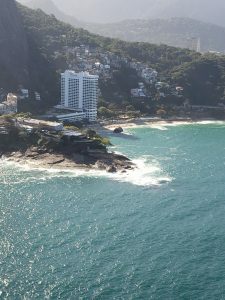 Many people react negatively to the fact that across the street from the hotel is the Vidigal favela (slum). 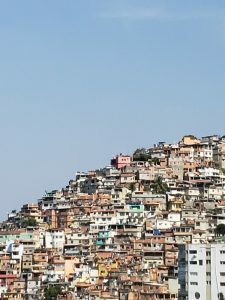 But most of the people living in the favela are hardworking and honest but happen to be poor due to the widespread inequality of wealth distribution in Brazil. As a matter of fact, most of the hotel workers are from the favela and are the ones responsible for the quality service it provides. I was really looking forward to my month long stay in the hotel! 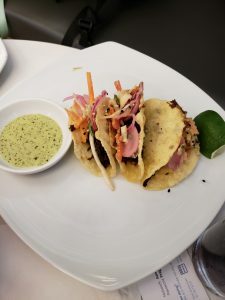 Author gringo10_wpPosted on January 11, 2019 Leave a comment on Wheels Up! Why take an MD80 when you can fly a 767 for the same price! 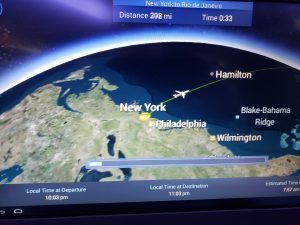 I recently flew an American Airlines domestic first class flight from NYC to Miami. As an experienced aviation geek, I always choose the best airline configuration for my flight. But on this flight, I hit the jackpot! There were about 10 flights flying that day, most being on 737’s or MD 80’s (which had the normal domestic first class configuration). 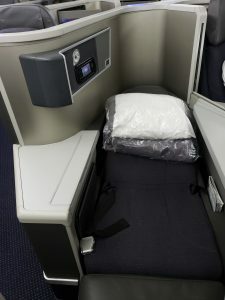 But I noticed one flight was on a 767-300, which has an international first class configuration. Meaning for the same price, I would be flying in a flat bed seat! 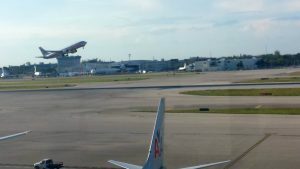 The reason is that many of these planes will be taking off from Miami for an international destination. The seat was great, the meal was surprisingly good (chicken breast over couscous and pretzel bread) but the service was not good! The flight attendants would constantly tell us to wait when requesting something and they would hide and talk in the galley. There was no Wi-Fi and most surprisingly, there was no screen on the seat back for IFE- only overhead screens above every few seats. 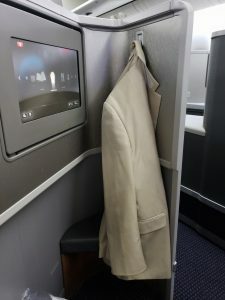 Since the flight was only two and a half hours, these things were not that hard to endure because the seat made up for it! 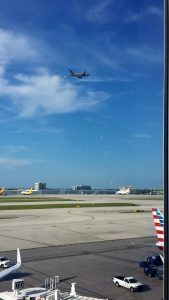 Author gringo10_wpPosted on December 27, 2017 December 27, 2017 Leave a comment on Why take an MD80 when you can fly a 767 for the same price! 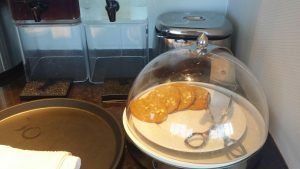 I recently came home from a nearly 3 week stay at the Cove Atlantis. I come every year. Before the Cove was built, I had stayed at Atlantis once, at the Royal Towers. It was so crowded that it seemed like Grand Central Station in New York at 4pm on a summer, Friday afternoon (you get the picture) and because of this, I vowed never to return. Then the Cove was built. More expensive meant it was less crowded. It was also located away from the other hotels which meant a pretty quick escape from the madness. 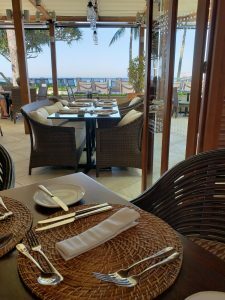 The rooms were new and beautiful, there was a private beach and adult pool, and Mosaic, a gourmet buffet which is constantly voted one of the best restaurants in the Bahamas, was located on site. That was then! My recent trip was not bad, but given the cost was not good enough a value proposition to justify returning. 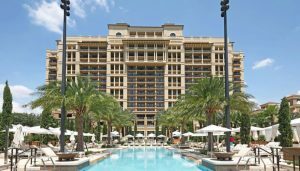 The Cove touts itself as part of Marriott’s Autograph Collection, but gives no recognition or benefit to Marriott highest tier frequent quests (I am a Marriott Platinum, the highest tier and got no upgrade, no Club level access, no late check-out….nothing). And if you don’t book directly with the hotel, you won’t even earn Marriott points for your stay! The rooms were nice ten years ago, but are starting to show their age. And the hotel was taken over by a private equity firm investor after the original Atlantis owner defaulted in making payment on its note. And as all private equity firms, only interested in an exit strategy on their investment, begin to cut the amount of employees at the property to save money, are not willing to make any further investment and thus the service suffers. In the past, this would not have really affected Atlantis, as it was “the only show in town”. However, with the recent opening of Bahamar, which has the largest casino in the Caribbean, and when all is finished will have a Grand Hyatt, Rosewood and SLS hotels (all luxury), this is no longer the case. The counter argument is that Bahamar is for single adults and couples and Atlantis is for kids, so it will always make money. But Bahamar recently bought the former Wyndham Crystal Palace and will turn this property into a water park, so it is challenging Atlantis on all levels. I have many find memories of my stays at the Cove Atlantis but for now it is just a fading star! Author gringo10_wpPosted on October 8, 2017 October 8, 2017 Leave a comment on Atlantis…..a Fading Star! If This Hotel Works Out a Few Kinks in its Service, It Will Put All of the Other Disney Hotels Out of Business! another review then). As a frequent guest at the Grand Floridian and every other luxury hotel in the area, I can only say that once the Disney Four Seasons cleans up its front desk service act, these hotels better watch out because this will be the only real luxury choice in the Disney area! 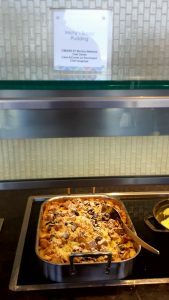 Author gringo10_wpPosted on July 30, 2017 July 30, 2017 Leave a comment on If This Hotel Works Out a Few Kinks in its Service, It Will Put All of the Other Disney Hotels Out of Business! Burj al Arab-still the world’s best luxury hotel! 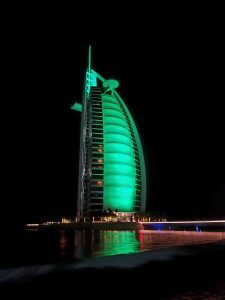 I have been a guest at the Burj al Arab every couple of years over the last few years. And yet every time I come to the Burj, I desire to return. 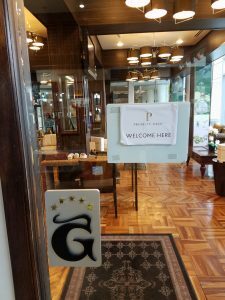 There are many great hotels in the world. There are many great hotels in Dubai. But for the Burj, any one of these other hotels could be the world’s best. But the Burj is in a class by itself. There is the Burj and then there are all of the other hotels. 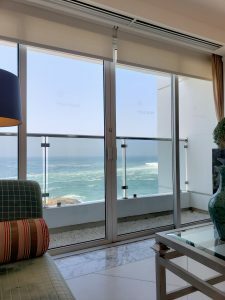 The Burj does it with its unmatched hard product- every room is at least a duplex one bedroom suite (many are two and three bedroom suites), beautiful spa, pool and beach and a variety of restaurants serving distinctly delicious food. But what really sets the Burj apart is its unrivalled soft product-its service and its people. A team of polished butlers outside your door 24 hours to fulfill nearly any request. Every employee greets you with a smile, many by your name. This is what differentiates the Burj. And this is how the Burj is able to become not only the hotel in a destination, but the destination itself! And this is the most sought after branding accomplishment, yet the most difficult to achieve. Since the Burj is firmly anchored with luxury hotel veterans such as Mr. Ahmed Ereiba and Ms. Stephanie Zawada, I am sure that it will continue to be the World’s Best Luxury Hotel for years to come! Author gringo10_wpPosted on May 20, 2017 Leave a comment on Burj al Arab-still the world’s best luxury hotel! Tip #1- Don’t skip Tahiti on the way to the other islands. 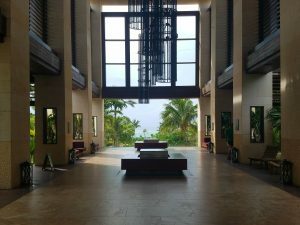 Tip #2- Stay at the Intercontinental Tahiti! I recently arrived in French Polynesia. Everyone was telling me to skip Tahiti (land there and take a plane to Bora Bora or a ferry to Moorea (my response was that I did not come only to see tourists on their honeymoon-I came to see French Polynesia (meet the locals, hear their language and music, eat their food, learn their customs) So glad I did! 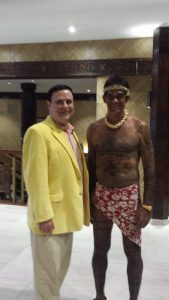 And the best choice when in Tahiti is the InterContinental Resort and Spa. Beautiful setting (a view of the volcano mountaintops of Moorea), 5 minutes to the airport, 10 minutes to the capital of Papeete, great restaurants and spa and really helpful and friendly staff. And with the new GM, Mr. Thierry Brovelli (who is a hotel industry expert and veteran, I can only see this hotel going from good to better! So instead of saying “Nana” (goodbye) to Tahiti, say “Ia Orana” (welcome and hello) to the InterContinental Resort and Spa Tahiti! Airports are hectic these days. 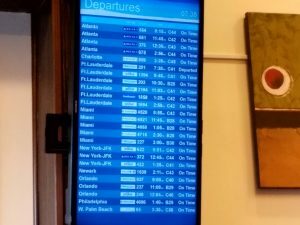 More people are traveling, security lines are long, planes are full, flights are delayed or cancelled, and luggage is lost. In other words beaucoup stress! 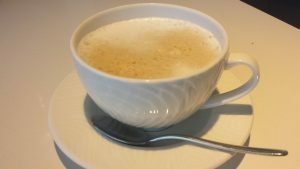 That is the reason that an airport lounge can be an oasis of calm and relaxation in an otherwise hectic place. 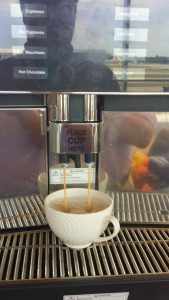 Not all airport lounges are created the same, however! 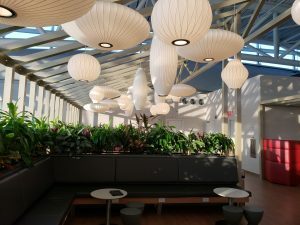 On the domestic front, the best are not the airlines’ own lounges (American Admiral’s Club, United Club, Delta SkyClub) but the American Express Centurion Lounges (already in NYC (LGA), Miami (which I have recently reviewed on this blog), Dallas, Seattle, San Francisco and Las Vegas). 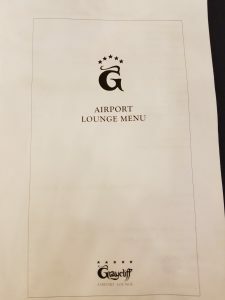 And while on the domestic front Amex rules, it cannot hold a candle to the best international lounges, which by the way are all owned by airlines. 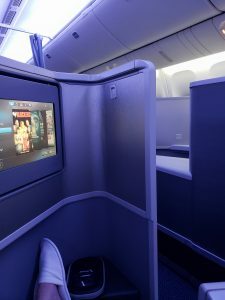 Caviar, non-stop champagne, massages and haircuts, a la carte meals and even private sleeping rooms with showers and television sets are some of the common perks of these best lounges, belonging to Emirates, Etihad, Qatar, Lufthansa, Cathay Pacific, Singapore, Thai Airways and Air France. Lufthansa not only has a beautiful first class lounge in Frankfurt, but a whole First Class Terminal! Now that’s traveling! Aside from these aspirational superstar lounges however, a decent lounge will be a quiet place where you can wait for your flight, have a drink, a snack or light meal, use the restroom or take a shower, and get some work done. 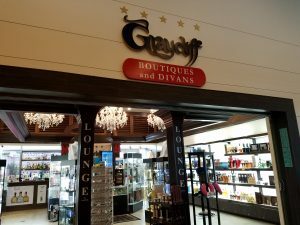 On this note, I recently visited Graycliff Lounge at the airport in Nassau, Bahamas while waiting for my flight to Miami. The lounge is on the second floor of the airport near all of the departure gates. The lounge also contains a gift shop (which you can see in the above photo). Upon entering, you will be asked for your credentials for entering the lounge. For example, I entered using my Priority Pass, which gives me free access to over 600 airport lounges worldwide. 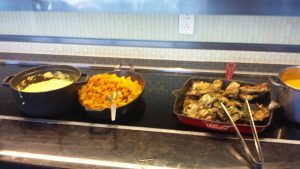 At the Graycliff Lounge, I can also bring in immediate family members or two guests for free. The lounge is small but very nice and quiet (not too crowded). 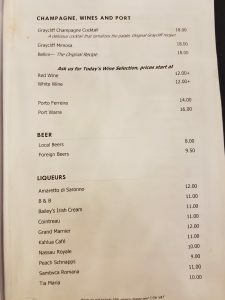 I was then given a menu and was told I could order something to eat and drink. 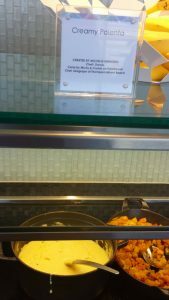 Most lounges have buffets or self-serve drink and snack selections and a bar for alcoholic beverages. 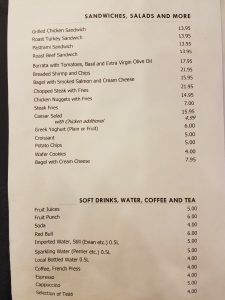 The Graycliff Lounge, however, gives you a menu and a certain amount of credit to order something to eat and drink (around $20 per person). 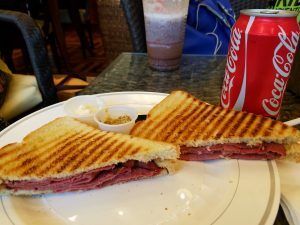 I ordered a pastrami panini and a Coke. Outside the main seating area is a small bar where they can make you a cocktail, or you can order a beer, soda or an espresso. 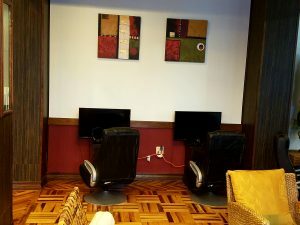 Inside the lounge, there are two computers for you to use, free wifi to use on your own device, and a couple of television sets. Nassau’s airport is not large so you will never have a long layover there. 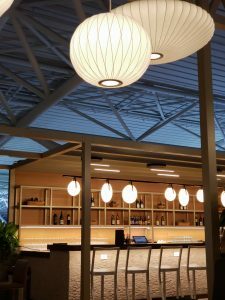 It does have many flights, however, especially from Florida This makes the Graycliff Lounge the perfect place to relax for an hour with a snack and drink before your flight departure. 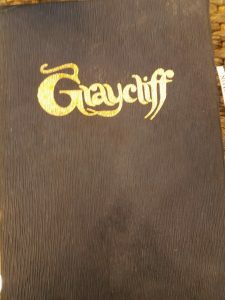 Have you ever visited the Graycliff Lounge? What did you think? 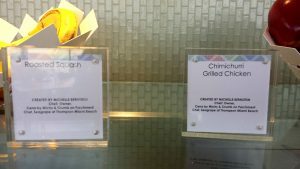 The Amex Centurion Lounge in Miami- a worthwhile detour! I booked a flight from New York City to the Bahamas. 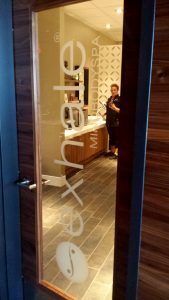 I could have booked a direct flight, but I purposely scheduled a five hour stopover in Miami so that I could experience the new Amex Centurion Lounge at Miami International Airport. 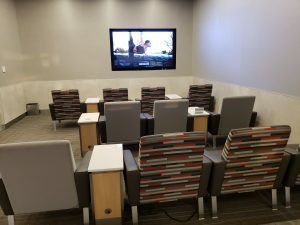 For years, Amex had been dependent upon their partner airlines for lounge access, but after Continental Airlines(now United) terminated access for Amex cardholders, Amex started building their own Amex branded lounges. 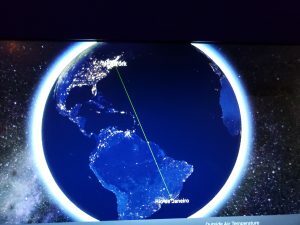 There are currently Amex Centurion airport lounges in New York (Laguardia), Miami, Las Vegas, San Francisco, Seattle, Dallas-Fort Worth and Houston, with more to come! I landed in Miami and quickly entered the lounge. Lounge access is free for Amex Centurion and Platinum Card holders along with 2 guests or their spouse and children under 18 years old. 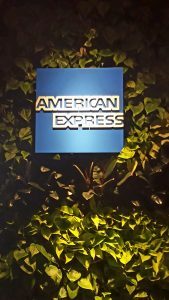 Other Amex card holders can access the lounge (space permitting) by paying $50. 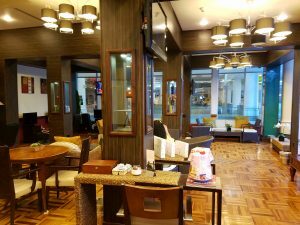 The lounge is modern, spacious and comfortable, with ample seating. In addition to the main seating area, there are 2 or 3 smaller seating areas, one of which is my favorite, since it is more quiet and private. One of the great things about the lounge is the gourmet food and drink selection. 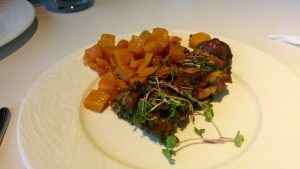 The menu is prepared by the famous Miami based chef, Michelle Bernstein, an expert in Latino inspired dishes. 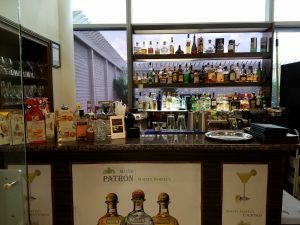 There is also a full bar with free premium alcohol and signature cocktails. I chose the chimuchurri grilled chicken and roasted squash. 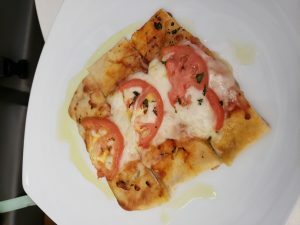 They also had a delicious looking polenta dish. I did however try the delicious salad. 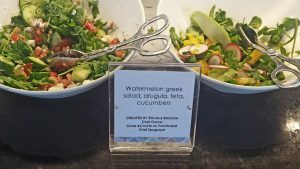 Watermelon, greek salad, arugula, feta and cucumbers-the sweet, tart and salty flavor contrasts was just amazing. All this eating made me thirsty so I always kept the bar in sight! Dessert was a hard cchoice-Michy’s bread pudding or those warm, gooey macadamia nut cookies-so I did the only fair thing-I had both! And dessert was followed by a cappuccino. 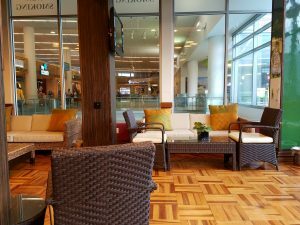 The lounge was a great place for watching the planes take off due to the large floor to ceiling windows. 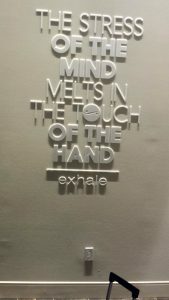 The high point of the lounge, however, was its Exhale Spa, which offers complimentary 15 minute neck and back massages and manicures. It is by appointment and the ability to book one (or more) appointments depends on what time you get to the lounge and how long you will be there. Upon entering the lounge at 1:00pm the lounge was rather empty, so I had a back and neck massage at 1:30pm. 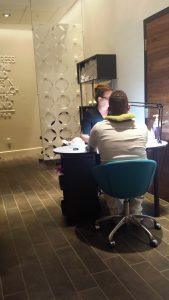 When I finished the massage at 1:45pm, I immediately booked the men’s manicure for 2:30pm. 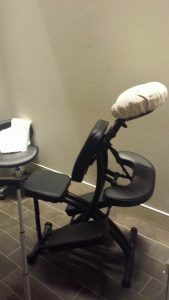 Both the massage and manicure were great and relaxing! 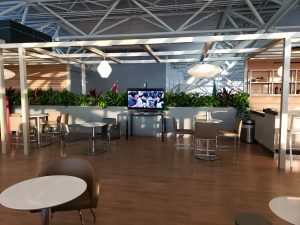 Amex did a great thing by building their own airport lounges. 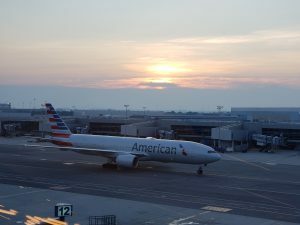 Besides the obvious branding benefits, they can no longer be held captive by partner airlines. 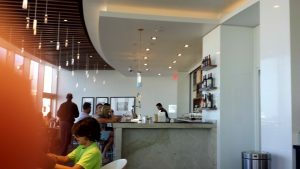 I spent a great afternoon at the Amex Centurion Lounge in Miami- great food, great drinks and great spa treatments. 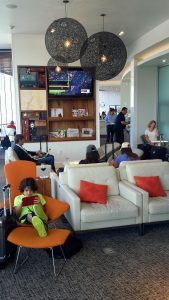 So when you are flying close to Miami, this lounge makes a worthwhile detour! 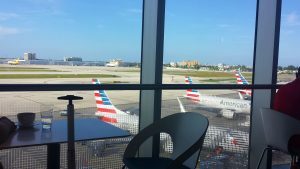 Author gringo10_wpPosted on July 24, 2016 Leave a comment on The Amex Centurion Lounge in Miami- a worthwhile detour!